When this happens, you want to be prepared for an immediate response with all the supplies you need to patch up and get back on the field. Whether you're taking care of yourself during independent training sessions or taking care of an entire team of dedicated athletes as their designated first responder, you need a medical bag that's up to the task. Which medical bag is right for you?  It all depends on the intensity of the activities and number of people you'll need to support it. 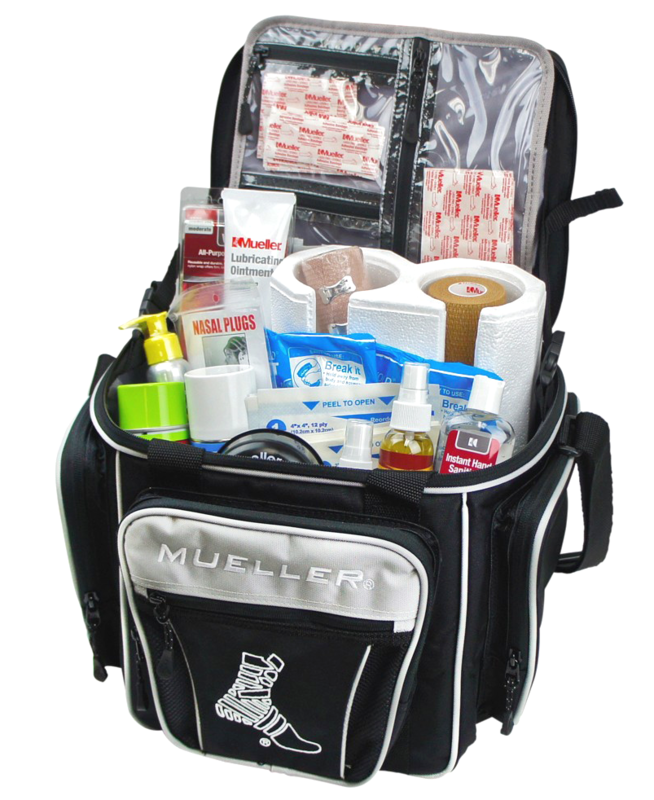 Here at Mueller Sports Medicine, we want you to be completely prepared for whatever happens both on and off the field. To keep you well stocked and ready for anything, we offer a selection of pre-packed first aid kits and medical bags that can be put to use the moment they arrive. Our kits range from a small personal pack to bags big and stocked enough to handle an entire sports team. If you're a professional medic looking to keep a personally stocked bag, we also offer a great selection of empty medical bags and easy to order supplies refill sets along with individual items so you can restock your kit altogether or piece by piece. 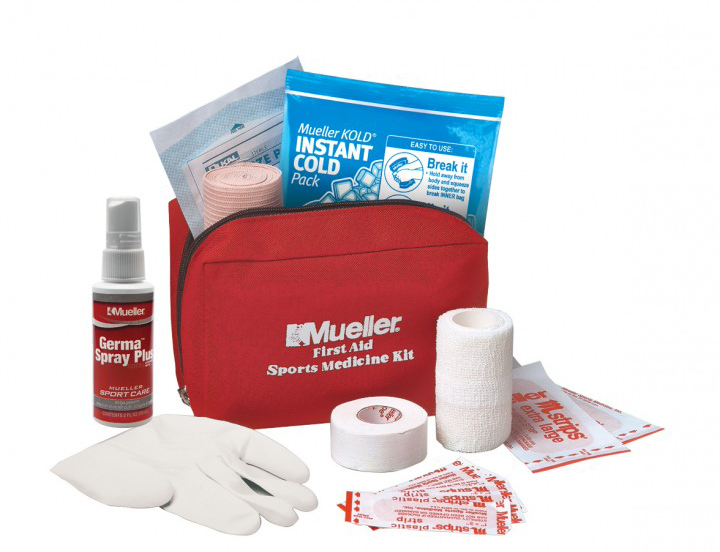 This is the smallest of our kits, but it's still packed with enough useful supplies to treat any manner of scrape or sprain that occurs during your athletic activities. The practically compact kit is about the size of a small fanny pack at 7.5"x3"x5" and is perfect for a single athlete or low-impact practice. You can easily carry this pack with you in a larger bag or strapped to your body as you go for long runs, practice your backhand, or even a little quiet rock climbing. For something a bit bigger and better equipped to handle several injuries from a single re-stock, there's the league first aid kit. Complete enough to be considered as one of the forerunners in medical kit packaging, this red rectangular bag is a little bit smaller than a laptop case at 10"x2.5"x8" with a convenient zip and handles. The bag opens like a binder and everything inside is held in place by two mesh compartments on either side. This kit is not only perfect for a coach or first responder of a hard-working team, it's also exactly the right gear to take with you on a camping trip with a few friends or a group of scouts. Don't let the "Jr" in the title fool you, this complete first aid kit is anything but child-like. 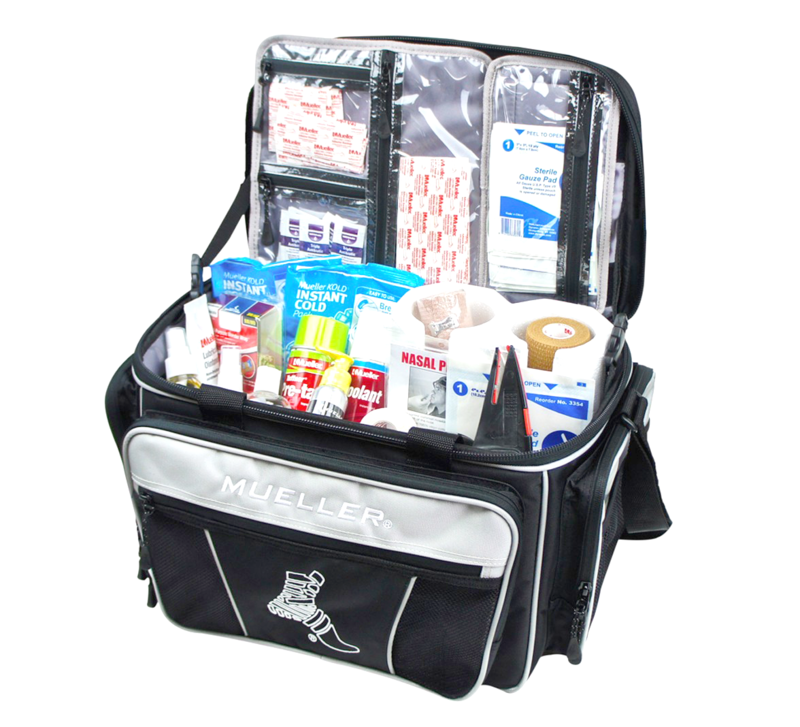 Kept in a safe and incredibly sturdy soft 10"x10"x10" kit with multiple handy compartments, this kit contains a plethora of medical supplies, assuming you'll be working out of it through many intense games keeping your players and/or teammates safe from serious injury with quick and total medical response. The case is made of rugged nylon with reflective piping to make it more visible in low-light situations. It comes with a small selection of interchangeable interior accessories and unzips all the way open for quick and easy access to your medical supplies. Whew! If somehow this isn't enough of a kit for you, there's the big brother to this Jr kit that's even bigger. Meet the big brother. This full-sized medical kit has everything you could need and extra room to boot. The Hero Response soft kit comes in the same rugged nylon with reflective piping but in a wider bag capable of carrying a truly impressive amount of medical supplies wherever you need to go. Carry it by the handles or throw it over your shoulder because when the tough get going, sometimes injuries happen. This kit is tough, sturdy, and crack resistant down to negative 40 degrees F, just in case you need to rescue someone from a freezer or during practice in the dead of winter. What we include in the Hero Response kit exactly matches how we stock the Jr kit, with with a great deal of additional space for other special supplies that you and your team may need on the field or out training. We recommend having at least one elbow, knee, and a wrist brace on hand along with a collection of elastic bandages, as these items are always useful and you never know when you might need them. You can also simply super-stock up on supplies with one or more of our handy refill kits, which includes the same set of items all over again. With this, you can always be sure that you have enough medical supplies to take care of any possible situation. While we've put a lot of thought into what we pack in the field-ready kits, not every medic will want a pre-arranged package and we understand. That's the reason we also sell a large variety of medical bags and supplies so you can build your bag with exactly what your team and techniques required. Are you a guru with the athletic tape? Prefer ointment to spray or, perhaps, simply have a few favorite products you'd rather pack than what's in the kits? That's great! We want you to be ready for your next moment as a medical hero out on the field. From our medical bag selection, you can choose anything from a small hip pack to a full-sized rolling suitcase big enough to store folding crutches in. There are lunch-box sized bags, a messenger-style bag, and even a large duffel-sized medical bag. To help you stay organized, we also have a number of dividers, clear pouches, and mesh pockets available based on the model of bag you prefer. Once you've got a bag, simply stock up on all your favorite sports medicine supplies and we'll happily deliver it all to your door or place of work.